Does physician compensation differ in an accountable care organization? A new study published in the Annals of Family Medicine(annfammed.org) suggests that family physicians in accountable care organizations (ACOs) may not be paid that much differently than their counterparts in non-ACO practices. The study also raises questions about the ability of ACOs to affect cost and quality if physician payment incentives are not aligned with those of the ACO. • practices participating in an ACO regardless of their risk for primary care costs. • Physicians in ACOs and non-ACO practices with no substantial risk for costs were compensated similarly; on average, they received nearly one-half of their compensation from salary, slightly less from productivity, and about 5 percent from quality and other factors. 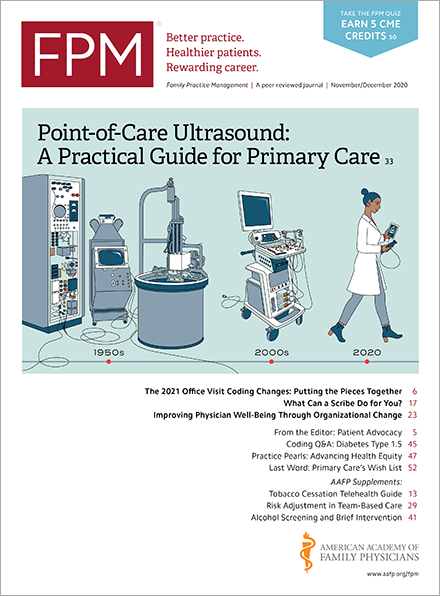 • Physicians not in ACOs but with substantial risk for primary care costs received two-thirds of their compensation from salary, nearly one-third from productivity, and slightly more than 1 percent from quality and other factors. • Participation in ACOs was associated with significantly higher physician compensation for quality; however, ACO participation was not significantly associated with compensation from salary, whereas financial risk was associated with much greater compensation from salary. The authors concluded that although practices in ACOs provide higher compensation for quality, compared with practices at large, they provide a similar mix of compensation based on productivity and salary. The authors also concluded that incentives for ACOs may not be strong enough to encourage practices to change physician compensation policies for better patient experience, improved population health, and lower per capita costs. As the study authors themselves ask, if physicians in ACOs and physicians outside ACOs are paid similarly, will they practice differently? The corollary question would seem to be, if they don’t, will ACOs still be able to deliver the lower cost and better quality that they otherwise promise? Only time and additional research will likely tell. Home / Journals / FPM Home / Getting Paid Blog / Does physician compensation differ in an accountable care organization?